SOUL STIMULATION, Nojazz last release, is an album everybody should listen to. It makes you dance, sing, groove. With songs that enlighten your mind, body and soul, Nojazz reflects its time. Nojazz is in da place! No Doubt it’s Nojazz ! 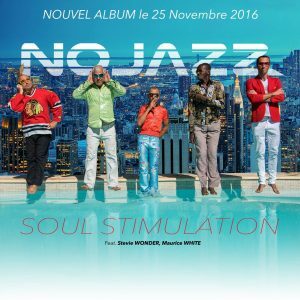 As their new album SOUL STIMULATION was released, we had the great pleasure to follow Nojazz during the Release Party organised on December 1, at the Zèbre de Belleville, in Paris. Nojazz is the amazing combo of five talented musicians, each of them bringing their own musical world. And so we have Philippe Balatier on keys, programming & jumping, Philippe Sellam on saxophone and on flowery patterned shirts, Pascal Reva on drums, guitar and Astérix braided hair, Sylvain Gontard on trompetta and Hollywood Star glasses and last but not least, Classy Jeffrey on vocals and at great dancing steps. Nojazz, it’s 15 years of creativity, of numerous collaborations, over 50 countries visited for concerts and 6 albums, all of them being real dynamite. And Stevie Wonder’s eagle ear was right when he first met them in Los Angeles back in 2005. Our spiritual father got the feeling for the NoFrontier Nojazz. This is something they have in common : playing music without bothering for labels. Nojazz music is the deep essence of what jazz was meant to be : a music that makes you feel fine, that makes you dance like Count Basie or Ellington band would. Without forgetting the impro to create a party, with an incredible show on stage. Wayne Vaughn who plays on Nobody Else and Kool reminds us that it is what jazz is about (cf interview) : it’a about entertaining, partying and having fun. Nojazz travels and takes us along the journey of various sounds and influences, without caring for codes or labels. Nojazz goal is to make you have fun. And when you listen to SOUL STIMULATION – that should have been called Body & Soul Stimulation (It’s so groovy you cannot help dancing ! ), you recharge your batteries, gaining more fun, soul and groove, the musical compositions always being flawless. There is only one problem : it’s toooooo shooort ! 1 – Change does announce the soul-funky color of the album : a song that already has the flavor of a hit, with Jeffrey’s voice combined with the brass, and a rhythmic that prevents you from sitting down. 2 – C’mon Talk (Jarle Benhoft’s song), is a more electro-pop sound with the Nojazz brass signature. 4 – Two hours starts with a typical Nojazz intro, on which Jeffrey sets his voice like the sweetest melody. 6 – and there we go dancing again on the sublime My Kind of Blue… No doubt these rhythm and soul are going to make you move and sing again. An amazing soul-funk-rap structure, with the brass wrapping the whole stuff in velvet. 7 – Seven to Five is getting souler and souler to take you nearer from the stars. And always these brass and their funky touch sometimes ringing the NO bell ! But it’s sheer NOJAZZ till the end… Don’t mess around baby ! 11 – Have Fun, olala that’s a jewel ! Some Nojazz music cooked with Stevie Wonder harmonica sauce, Guillaume Poncelet ‘s rhodes and the very efficient rap of Bishop Lamont. The NOJAZZ musicians are definitely in their element and are enjoying every beat « from the top to the bottom » ! 12 – Kool is the track that gathers everybody : the Vaughn Family, Maurice White and Stevie Wonder among others… and there it goes again, from the very first harmonica notes it does swing like crazy. The soul-groove Kool attitude is right there !